The Lightstreamer Blog: Happy Technology from Lightstreamer! Weswit Srl, the maker of Lightstreamer, would like to wish you happiness and great technological choices for this end of year and the beginning of 2012! As you probably know, Lightstreamer is the leading technology for exchanging low-latency real-time data over the Web. You take care of your application, we take care of efficient and reliable data delivery, whatever platforms you are using on the server side (Java, .NET, etc.) and on the client side (web browsers, native mobile apps, or whatever). 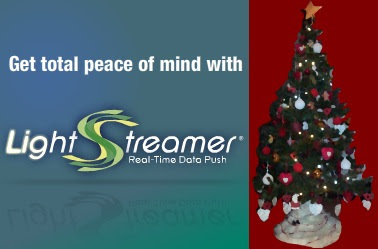 More and more finance, aerospace, gaming, and other types of companies are taking benefit from the real-time communication capabilities of Lightstreamer, moving toward the True Real-Time Web. Expect many exciting news in the course of 2012 as for Weswit's product offering!